* The coupon is not available for ACID Pro 365 in the 3-month version. 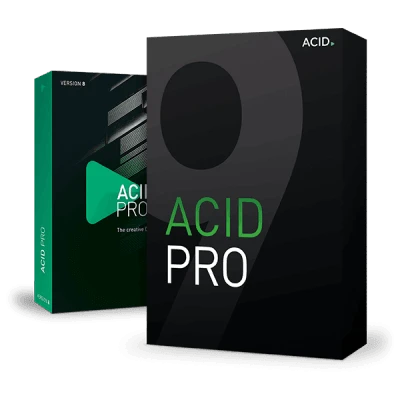 ACID Pro 8 is the creative DAW for today's artists and producers. Behind its refined and sleek interface lies a powerful, feature-rich DAW where sophisticated tools sit side-by-side creating an easy-to-use workflow. 64-bit power allows even the most complex of projects to be handled with ease, while dozens of instruments and effects combined with thousands of ACIDized loops produces the ultimate DAW for music composition. ACID defined loop-based music production 20 years ago and now ACID Pro 8 refines it for today's creative musician. At its heart, ACID Pro 8 uses ACIDized loops which are at the core of creative loop-based music production. Yet these are so much more than simple audio files. They contain pitch, length and transient data and can be edited and manipulated in real time and easily mixed together to make complete pieces of music. ACID Pro 8 offers uncompromising 24-bit, 192kHz multitrack audio recording. With an array of pro-level features, ACID Pro is ideal for recording an entire band session in the studio or for creating loop or MIDI-based compositions on the road or at home. ACID Pro 8 has a 64-bit engine and works together with your PC to bring maximum power and efficiency to your music making. Whether you are making 24-bit/192kHz multitrack recordings, mixing with multiple effects in real time or composing with the dozens of plug-in instruments, ACID Pro 8 will step up to the plate and offer you all the latency-free power you need. With a dedicated and feature-rich mixing console, ACID Pro 8 offers an incredibly flexible recording environment. It's easy to assign plug-in effects, adjust the routing or work with external effects and MIDI devices. ACID Pro 8 supports control surfaces such as Mackie Control and Frontier Design TranzPort so you can enjoy a more traditional hardware mixing experience. ACID Pro 8's mixing console might look like a traditional studio mixer but you can easily customize it to match your unique workflow. An array of routing options allows for total recording flexibility. Recording external audio utilizing ACID Pro 8's effects is easy and you can also use external effects processors on tracks and busses, create complex submixes with bus-to-bus routing while monitoring everything in real time. ACID Pro 8 is also set up for mixing surround projects, with a surround panner for precise control over channel positions. ACID Pro 8 supports Mackie Control Universal and Frontier Design TranzPort MID controllers. You can use one Mackie Control Universal (with up to four Mackie Control Universal Extenders), one Frontier TranzPort, and up to five generic control surfaces with ACID. Control surfaces can be custom mapped and help you stay organized by knowing which channels are dedicated to external control. ACID Pro 8 offers many creative tools for today's producer. It's easy to divide your project into logical sections and then arrange them on the timeline. Tracks can be organized by placing them into Track Folders and then cluster editing allows you to drag, pitch-shift, cut, copy, and paste whole sections of an arrangement to help you easily create complete tunes. Mixing is just the beginning. ACID Pro 8's many features include the Beatmapper and Chopper tools which make remixing music easy. Beatmapper helps you identify tempo and time signature information from external audio files so you can add ACIDized files to it to create a remix. 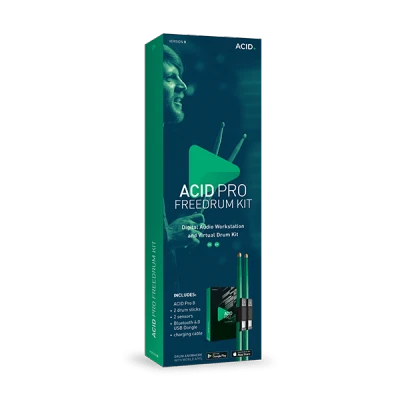 ACID Pro 8's Chopper tool slices up your audio file and also helps you create impressive drum fills, stutters, and DJ effects. Chopper and Beatmapper make ACID Pro 8 a powerful DAW for remixers and dance producers. Beatmapper offers a super fast and slick process to remix music in ACID Pro 8. It identifies the tempo and time signature information in external audio files – including MP3s and complete songs – and allows you to label and edit the file with that information. You can then create Beatmap songs and when other clips are added, they all lock to the tempo of the imported file allowing quick and easy remixing. Beatmapped audio files can also have their tempos and pitches edited for maximum flexibility. Chopper is a tool that allows you to slice and dice an audio file so you can re-order, remix, change its groove and replay it. It creates amazing rhythmic variations of the original audio and you can create many of your own customized samples from one original loop. Chopped events will play in sync with your ACID Pro 8 projects, and you can even use keyboard commands to drop events from the Chopper onto the timeline in real time. This virtual drum instrument is a fantastic beat-making tool and ideal for many current genres of music. Play huge trap beats, program pumping techno grooves or even create a furious double bass in a metal style! All the beats were recorded through an SSL for extra analog character. A classic piano instrument created by intricately sampling a concert grand piano being played in an international concert hall. It's the sound of an amazing instrument recorded in its natural environment, and the results are incredible, with the power and detail of the instrument shining through. This instrument was created by making recordings of a church organ in a church near Venice to achieve a totally authentic sound. It stylishly recreates the emotional and dramatic sounds of the original organ and is suited to both classical and contemporary music. This drum instrument is perfect for dubstep and hip-hop grooves. Behind its 8-bit style fascia are enough huge beats and hits to give your tunes an edge. Programming is easy too because Urban Drums is based on easy-to-use hardware beat makers, so just play the pads and hit record. This instrument is dedicated to providing a wide variety of vintage electric piano tones. You can use it for smokey jazz, melodic blues or funky riffs packed with overdrive. On-board effects help Electric Piano really come to life offering all the organic character of the real instrument. Big, bold and beautiful, Rock Drums is the perfect instrument for providing more dynamic beats to your music. You can get driving double bass for metal songs, reverberant drum grooves for a huge arena sound, or ease back with dry, clean studio drum sounds. The legendary MPC sampler launched a million beats and Drum Engine features a similar interface so you can program some incredible grooves. It includes a range of preset sounds – from modern pop kits to groove box samples – so you can create beats over a wide variety of styles. An instrument that creates the complete sound of a choir including classic choral arrangements, deep male voices, crystal-clear vocals sung by a female singers and mixed-voice choirs. Use it up front as the lead in your song or as an atmospheric backing to any piece of music. A synth instrument which is capable of producing everything from dreamy sequences to heavy basslines. There are also effect modules to take your sonics to extra-terrestrial pastures and produce atmospheres that could soundtrack any film. This virtual synthesizer emulates the classic sounds of legendary hardware synthesizers with total precision. With its retro design, and hands-on controls you'll be tweaking and creating vintage tones in no time. Take a trip back in time with a virtual instrument that is focused completely on vintage organ sounds. Original individual organs are authentically replicated and there are plenty of hands-on controls to shape the sounds. Electric Bass is an instrument that is perfect for laid-back funk riffs, soul ballads or as a groovy foundation for more current genres. It's an elegantly-designed plug-in with a multitude of options for custom sound design. This is a great instrument to provide a diverse range of smoother, more laid-back beats. Jazz Drums covers everything from the driving pulse of a classic jazz tune to a more abstract groove for an electronic-based track. Pop Brass has it all: slick funk, orchestra arrangements, tight Latino rhythms and the sound of the roaring '20s. It is is perfect for both elaborate productions and creative jam sessions. Orchestral Ensemble contains various ensemble recordings of an orchestra complete with brass, woodwind, percussion and strings. With everything from angry brass staccatos and driving orchestral thrills to soft string legato, it is perfect for all film and pop music producers. Produce high-quality guitar sounds with energetic slides, aggressive power chords and squealing overdrives. This instrument combines different playing techniques with an extensive sound library, so you can create a vast amount of guitar sounds. Century Guitar offers exactly what you need: clean, authentic guitar melodies and accompaniments. The unadulterated sound with the highest attention to detail plus a wide range of expressive possibilities all guarantee an absolutely realistic playing experience. Soundtrack Percussion lets you create your own percussive scores and is perfect for adding a touch of drama to any soundtrack. The instrument features a wide range of sounds including bells, drums, thunder bells, gongs and Taiko drums, so is the ideal percussion partner. This virtual instrument contains a whole ensemble of powerful and stirring strings. From historical, classical string sounds to electronically manipulated effects, everything is included, old and new. Get those speaker cones rumbling with this collection of superb bass sounds. Create powerful and pumping bass lines and the perfect bass tone with plenty of filters and a wide variety of presets. From real orchestral sounds to classic jazz, Upright Bass contains a variety of acoustic sounds for dynamic, powerful and groovy bass lines that add depth and soul to any track. From classic piano to modern electro piano presets, this VST instrument contains fantastic sounds for pop, rock, jazz, hip hop, soul, RnB, house and other genres. The Space Pad synthesizer is particularly useful for out-of-this world sounds, offering multi-layered sonic textures, complex sequences and organic synthesizer sounds suitable for a variety of projects. MIDI – but without the mess. Audio control and MIDI in ACID Pro. ACID Pro features some of the most comprehensive, sophisticated and precise MIDI editing features. These include direct MIDI editing of data within the timeline, track freeze to audio, Keyframe automation and flexible drum editing. You get all the MIDI features you would expect from a high-end DAW but with user-friendly tools in a clean editing environment - MIDI control in ACID is intuitive, fun and hassle-free. Inline Editing allows you alter MIDI data directly in ACID's timeline within traditional piano roll and drum grid interfaces. You can edit note positions, velocities, pitch bends and controller information all on the main multitrack interface so there's no need to open another edit window. Drum Grid Mode is ACID Pro 8's easy and intuitive way of editing beats directly on the software's timeline. The grid style edit window shows all the drum parts and you can easily move, add or delete beats. This allows you to turn MIDI tracks that are being triggered by software instruments into audio. Freezing a track like this means less instruments need to be running in real time so it conserves valuable CPU processing power. Processing of multiple events or tracks of MIDI data can also be done directly on the ACID Pro 8 timeline. You can use quantization and global editing of velocity values, note event duration and more. ACID Pro 8 utilizes envelope and keyframe automation features. All MIDI continuous controller data used to edit parameters like pitch, modulation and expression – even the controls of a soft synth can be modified with smooth transitions. You can also use envelopes and keyframes on individual clips or make larger project-wide changes. Within ACID Pro 8, you can efficiently create and edit drum maps. This means that you can use templates to label patch and drum names for hardware or software-based MIDI synthesizers and drum machines. Templates can easily be saved and recalled. ACID Pro 8 will soon introduce VST3 support so be able to load in thousands of instruments and effects made by third party developers. 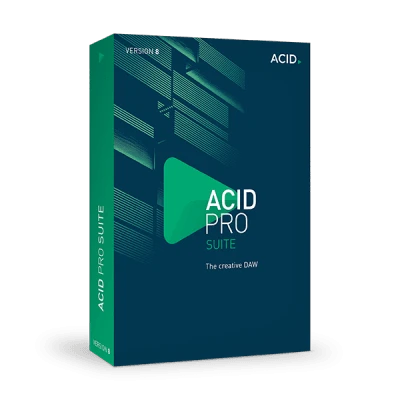 ACID invented the standard when it came to real-time audio editing and now ACID Pro has some of the most powerful audio features in any DAW. These include the famous ACID real-time pitch and time-stretching and sophisticated groove mapping where you can extract a groove from a loop and apply it to any audio file. A single click for you. A quantum leap for your sound. Take complete control over your groove! It's easy to give your music a completely new feel with ACID Pro 8's Groove Mapping and Groove Cloning quantization technology. You can apply preset grooves to a clip or track to give it a fresh new sound or extract the groove from one track and apply it to another. You can even create your own custom grooves from scratch or edit existing ones for total groove control. ACID Pro 8 features Zplane élastique Pro technology to ensure maximum sound quality and flexibility when dealing with pitch- and time-shifting of clips. It also ensures real-time, artifact-free time-stretching and pitch-shifting of Beatmapped tracks. ACID Pro 8 allows you to choose your own groove from various genres such as funk, hip hop, rock and more! This means that you can completely change the feel of your loops and MIDI files or simply add more soul to your music. It's easy to do – just choose your groove from ACID's Groove Pool and apply it to your loops or entire tracks. If you like the feel or rhythm of a loop you can extract its groove using ACID Pro 8's Groove Cloning feature. ACID analyses the groove in a clip's audio and extracts it so you can apply it to your own loops and MIDI files. This way you can create your own complete custom grooves from scratch and apply them to any loop, file or even a complete track. ACID Pro 8 uses envelopes to help you automate global parameters or modify pitch, modulation, expression or other MIDI data within a track. Envelopes can also be used to automate the controls on a plug-in instrument or create Tempo Curves for smooth tempo variations across a project. All envelopes can be drawn using a mouse or external control surface and then tidied up with keyframes or envelope thinners that help smooth them out. You can also use keyframes to help automate your 5.1 mixes on the timeline and use envelopes and keyframes to implement MIDI continuous controller data and program changes. ReWire technology allows compatible music packages to work with one another so you can route audio and MIDI data between them. ACID Pro 8 works as both a ReWire host and a device so you can set it up with other ReWire applications such as Sonar, Reason, Cubase, Live, or Pro Tools. You could then use Reason, for example, as a virtual instrument routed into ACID Pro 8 or route ACID Pro's output directly into Pro Tools. ACID Pro 8's Plug-In Manager gives you complete control over all of your audio plug-ins. You can quickly and easily add effects to a track, bus, assignable effects chain or soft synth bus. You can also rename and organize plug-ins to create a customized plug-in environment that fits your unique workflow. The new essentialFX Suite is a collection of 11 first-class plug-in effects suitable for all studio applications. Each of the effects uses high quality algorithms for a great sound and highly efficient operation. Clear controls for easy operation combined with low resource consumption and high-quality output make it the perfect suite of studio tools. A flexible gate for noise reduction with a soft knee option and side-chain filter function for rhythmic ducking effects. A channel strip optimized for vocal or speech recording featuring a compressor, deEsser, gate, high-pass filter and tone shaping. A classic compressor for leveling audio or adding punch. As well as standard controls it also features a soft clip function and advanced side-chain filter. A classic modulating tremolo effect plug-in with parameters for rate, shape, and tremolo and tempo sync and panning options. Add depth to your sound with a subtle chorus effect or more a dramatic flanging sound. It includes adjustable rate, depth, feedback and mix settings. A dynamic plug-in that specializes in filtering out unwanted sibilants in speech and vocal recordings. A classic phaser effect that adds movement to lead lines and more attitude to guitars. It features adjustable rate, depth, feedback and mix settings. An authentic analog tube amplifier simulation that offers a rounded and full-bodied sound. It features pre- and post-EQ and an oversampling mode. An efficient dynamic plug-in for increasing the loudness of the audio signal and preventing clipping. A straightforward plug-in for creating versatile reverb effects – from short to long reverberations – to add sparkle and atmosphere to your sound. A stereo delay to add interest to any track, this features individually adjustable delays for both channels, as well as a tempo sync feature. Analogue Modelling Suite offers a suite of first-class analog tools called AM|MUNITION, AM|PULSE, AM|TRACK and AM|PHIBIA. These deliver the highest quality sound experience and can also be used as a flexible and powerful mastering solution. A compressor/limiter that offers more kick. This dynamic mastering tool will deliver punch and also give your mixes more presence and character. A transient designer for detailed envelope editing and background noise reduction. A combination of analog compressor and tape simulator which offers classic analog character. A tube amp/channel strip used as a vocal preamp, guitar amp, or to create a warm sound. This suite of effects authentically emulates the natural, full sound of classic analog gear. It includes a chorus/flanger to give your sounds added depth and width or analog-style phasing effects. There's a delay for very realistic and inspiring tape echo effects, and a filter plug-in with overdrive and modulation which can dramatically alter any sound. Ecox is an inspiring delay plug-in that can recreate the sound and echo effect of old analog tape recorders. It is very straightforward to use and full of character, and it can produce lots of vintage tones: from lovely old grainy atmospheres to crazy multiple delays that last forever. This is a stereo filter with modulation and overdrive that can be applied to just about any sounds to get rich, varied and dramatic results. Turn a piano into a dark bass sound, a string into a monster synth or just put your looped beats through it for extra crunch and impact. Corvex is a modulation effect so can fatten sounds up with gentle chorusing or provide more dramatic tremolo effects for added wobble. If you need to add depth and layering to your audio then Covex is your go-to plug-in. Add more depth, atmosphere, sheen and texture to your productions with this high-quality reverb. It comes packed with presets for instruments, halls, rooms and vocals but you can also create your own custom reverb. VariVerb uses multiple algorithms to create varied reverbs with complex reflection patterns – modern, classic or artificial – so you can create exactly the sound you want. VariVerb II's algorithms can be used to create reverb effects well beyond those that simply add some sparkle to your sound. You can easily take preset effects into more complex sound design territory as you tweak parameters, add depth and texture. VariVerb II doesn't use impulse responses to create its reverb effects but utilizes complex reflection patterns and different software models. This means that VariVerb II offers enormous potential in terms of sound aesthetics, especially in effects areas such as modulation, which can't normally be created with a convoluted reverb. Vandal is the only virtual guitar and bass amplifier that gives you the characteristic sound and feel of real hardware, all tied to the flexibility and creative control that software offers. Vandal gives you the complete guitarist signal chain – stomp box, amplifier, speaker and microphone – at your fingertips for huge guitar-effect action. 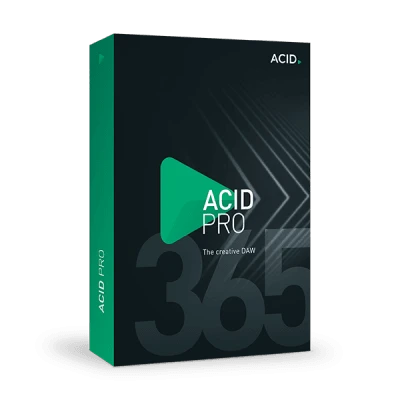 ACID Pro has all the mastering tools you need to give your music a professional edge and then to export it to CD or online streaming services in any audio format you require. ACID Pro 8 software has integrated track-at-once and disc-at-once CD burning, so you can burn audio CDs directly from the timeline at any point in the production process. ACID Pro 8 features powerful encoding functionality so you can save your songs in all of the popular streaming formats used on the Web, and also in formats used by your favorite portable players. Supported formats include MP3, WMA, WMV, AAC, FLAC and more.